Ski and snowboard hire in Les Gets has never been so easy! 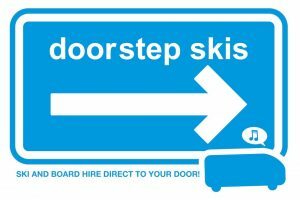 Ski-Lifts have teamed up with Doorstep Skis to offer you ski hire and snowboard hire delivered direct to your door upon your arrival in resort. No waiting around in ski shops to get your equipment…have your skis and snowboards fitted in the comfort of your own accommodation. To take advantage of their exceptional service, please click on the Doorstep Skis logo above and you will be redirected to their booking page. Ski-Lifts customers receive a 25% discount off ski and snowboard hire when booking with Doorstep Skis!